The HUBbox™ MkII is designed to the highest standards and is the ultimate addition to the 100/XFD optical fiber transport platform. The HUBbox™ is ideal for remote locations or as a stand-alone solution when 1 or 2 signals are required. These signals can be brought directly back into the 100/XFD system for conversion and monitoring at the central location. 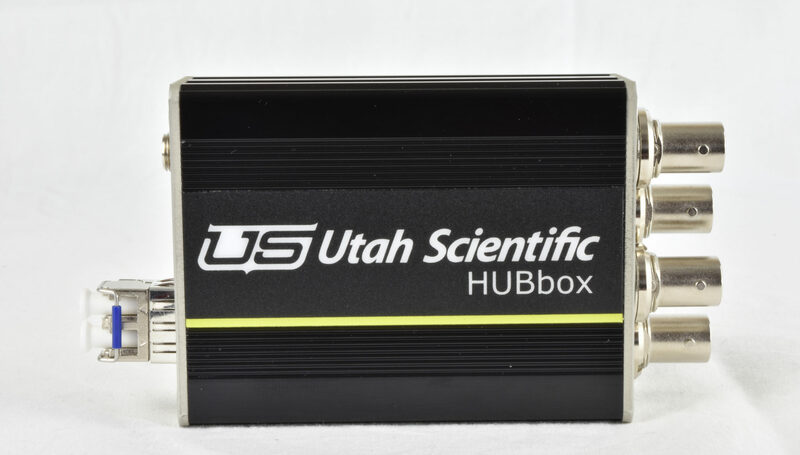 These fully compliant optics can be interchanged within the Utah Scientific ecosystem allowing for more powerful lasers, receivers with higher sensitivity, or even CWDM lasers. HUBbox™ MkII comes encased in a rugged housing, making it suitable also for outdoor applications. 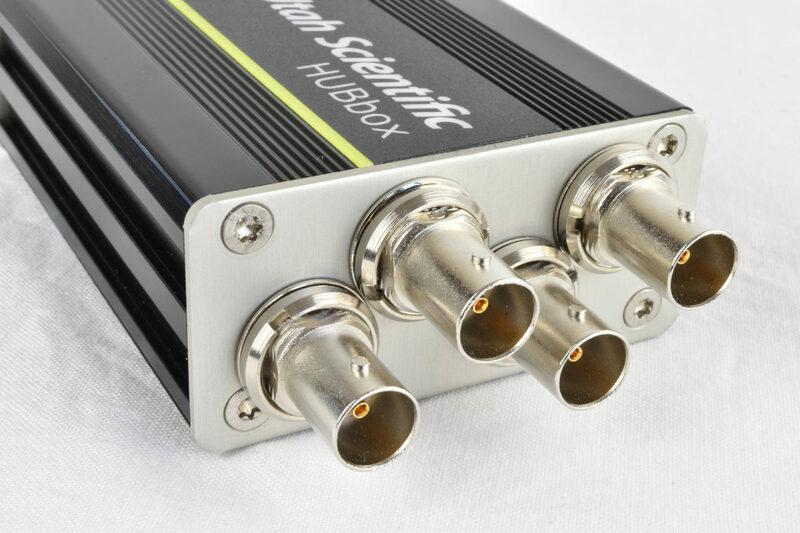 The HUBbox™ MkII is equipped with AutoSFP® functionality similar to the 100/XFD and OC-4B-SDI. This makes the HUBbox™ MkII extremely flexible. By simply replacing the SFP it can be easily changed into a dual receiver, dual transmitter, or a transceiver. Dual BNC’s per channel have been added to the design giving dual outputs or loop-through. Dual Optical Fiber to SDI converter supports 3G-/HD-/SD-SDI and DVB/ASI. Support data rates from 2Mbps to 3Gbps. It is housed in an extremely compact and rugged aluminum case ideally suited to both studio and portable applications. The HUBbox™ is perfect for using with the 100/XFD system where a signal is required remotely. 1 channel of SDI to Optical and 1 channel of Optical to SDI conversion. For 3G-/HD-/SD-SDI and DVB/ASI. Supports data rates from 2Mbps to 3Gbps. It is housed in an extremely compact and rugged aluminum case ideally suited to both studio and portable applications. The HUBbox™ is perfect for using with the 100/XFD system where a signal is required remotely. Dual SDI to Optical Fiber converter supports 3G-/HD-/SD-SDI and DVB/ASI. Support data rates from 2Mbps to 3Gbps. It is housed in a compact and rugged aluminum case ideally suited to both studio and portable applications. The HUBbox™ is perfect for using with the 100/XFD system where a signal is required remotely.